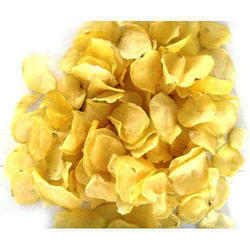 Prominent & Leading Manufacturer from Ahmedabad, we offer dehydrated potato flakes and potato dehydrated flakes. The Dehydrated Potato Flakes offered by us are used extensively for cooking purposes. High-quality potatoes are used in making these dehydrated potato flakes. Dehydrated potato flakes are used in retail mashed potato products, as ingredients in snacks, and even as food aid. Potato flour, another dehydrated product, is used by the food industry to bind meat mixtures and thicken gravies and soups. The dehydrated potato flakes have excellent in flavor. 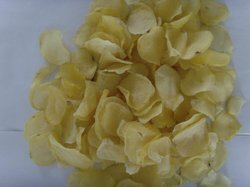 We are a leading manufacturer of Potato Flakes that are of high quality and have the same taste and odor as the fresh potato. Obtained by dehydrating potatoes, the potato flakes are extensively used as a nutritious food base in frozen food, baked goods, and soups. Available indices, shreds, flakes, granules, and slices, these dried potato products are widely appreciated for having additional proteins, fiber, vitamins, sugar, and minerals. Potato Dehydrated Flakes is made through an extensive process of washing, sometimes cooking, and then separating the starch present in potato cell walls so that it can be made into powdered or liquid form. Dehydrated potato flakes are considered a great alternative to other starches as thickening and a binding agent. 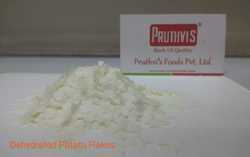 It is used in Ready to mix Soups and Sauces as it gives a translucent effect to the product. Looking for Potato Flakes ?